Designed by firefighters and built in the U.S., the Survival Axe Elite (formerly the Lil Trucker) includes multiple tools for many occasions. It’s the quintessential gadget for campers, contractors, RV-lovers, and good old fashioned zombie hunters. Some of the features include a replaceable folding saw, a glass breaker, a can opener, a hatchet blade, a hex wrench, a strap cutter, a hammer, a nail puller, and even more. Disclosure: Innovation Factory contacted me with an offer to try their newly introduced Survival Axe Elite (formerly known as the Lil Trucker). It was provided at no cost to me. My only responsibility was an agreement to complete this review after trying the item. I was not pressured in any way to make a positive endorsement. The Survival Axe Elite has quite the functionality. 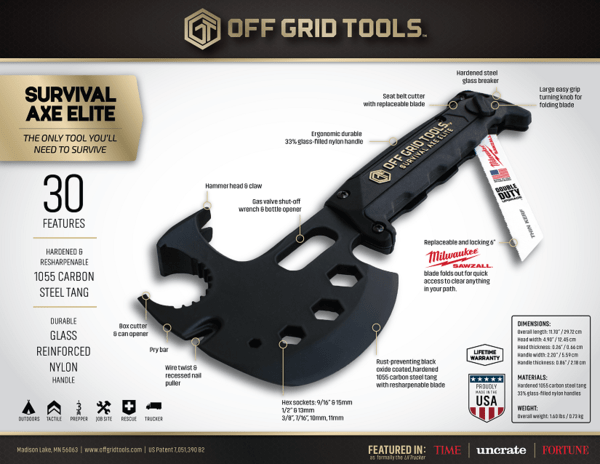 The Survival Axe Elite is quite the useful tool to take along on your camping trip, or keep in your RV. Hammer in tent stakes. Cut fishing line. Chop fire wood. Open a can of beans, or a bottle cap. I’m likely to keep it stowed in the back of my Subaru. However, I’m not likely to take it with me hiking. While the manufacturer has done everything they can to make the Survival Axe Elite as lightweight as possible, it also has to be sturdy. And with that comes heft. The tool weighs in right around three pounds, a bit much to stow in my pack. Really, the only feature I would be likely to use on the trail is the hatchet… to remove blowdown. For that I can carry a much lighter pruning saw. Nothing against the hatchet, it works fine. Just a bit too heavy. But it needs to be in order to be effective. I think this is a great idea and a useful tool. Just think practically, and take it with you where it’s most useful. Survival Axe Elite comes in two colors: black/gold and army green, and retails for US$89. You can purchase the tool from Innovation Factory with or without a sheath for the hatchet blade, an extra US$25. The product is also available at Amazon. The Survival Axe Elite comes with a Lifetime Warranty, and with free shipping over $75 in the continental U.S.